With dental veneers applied by Dr. E, the smile you have always wanted is available to you. Your teeth can be subject to wear or chipping, discoloration or other damage. 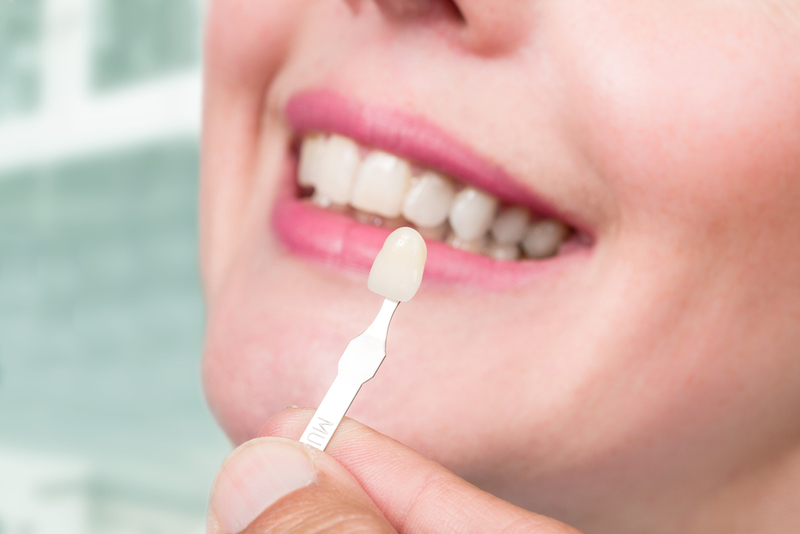 Dental veneers are thin, custom-made shells made to permanently cover the front of your teeth. Veneers can change the coloration and shape of your teeth, close spaces between teeth, and increase the length of your teeth to compensate for uneven lengths. Veneers can quickly, comfortably and beautifully transform your smile. Dental veneers can brighten front teeth that have permanent stains or discoloration that cannot be whitened. They may be used to correct small gaps between the front teeth, or to change the shape of teeth that are poorly shaped, slightly crooked or are worn/eroded at the gum line from aggressive brushing. The placement of veneers is usually an irreversible process since a small amount of enamel is removed from your natural teeth to apply the shell. Ask Dr. E if dental veneers are the right choice to achieve your smile.